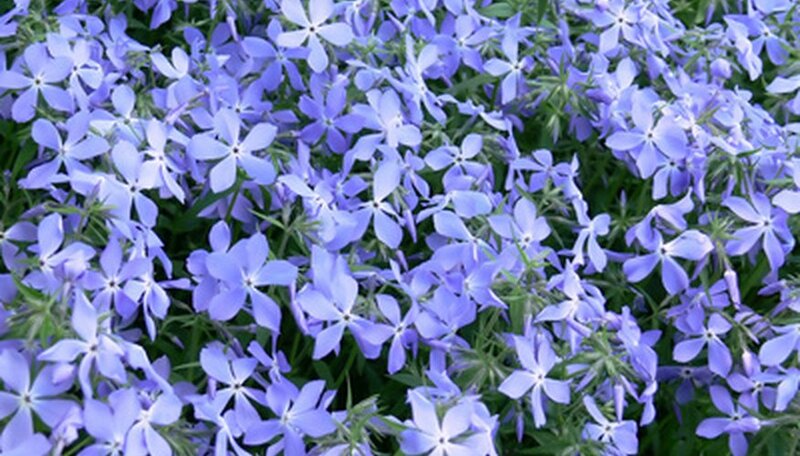 Phlox is a low-growing perennial plant that mounds beautifully in rock gardens. This plant also has a trailing tendency when placed near retaining walls or garden border edges. Grass and weeds can easily choke or kill this perennial groundcover. Learning how to keep grass out of phlox growing areas involves the physical removal of the intruder and prevention of future incursions in the garden space. Use the trowel to dig to a 6-inch depth around grass areas growing in or around the creeping phlox. Remove each grass clump to remove the roots. Root systems can extend for many inches beneath the soil surface. Remove as many as possible and dispose of clumps in yard waste bags. The use of spray herbicides is not recommended since close proximity may result in overspray onto the phlox or exposure through the soil. Pull apart portions of the phlox plant to examine the interior for grass growing inside the clump. Carefully dig up any grass inside the plant. If small portions of the phlox uproot during this process, simply dig a shallow planting hole to replant the phlox and press down to firm the soil around the roots. Dig an edging trench along the border of the garden housing the phlox plant. Create this trench by placing the shovel at a 45-degree angle at the garden edge. Dig to a 6-inch depth around the perimeter of the garden and remove the soil from the trench. Discard grass in yard waste bags and break up dirt clumps to spread around the garden. This method of edging discourages future incursion of grass into the phlox garden. Edging trenches must be regularly maintained every two to three months. Place a layer of four sheets of newspaper around the phlox plant. This barrier method of weed control will temporarily limit the growth of future grasses around the plant. Place a 4-inch layer of mulch around the phlox plant. Cover the newspaper sheets completely with mulch. Sprinkle small amounts of mulch into the open portions of the phlox to discourage future grass formation in the phlox plant. Mulch forms a natural barrier that limits light and moisture to the grass. Extend the mulched area into the edging trench to provide additional coverage at the edge of the garden.